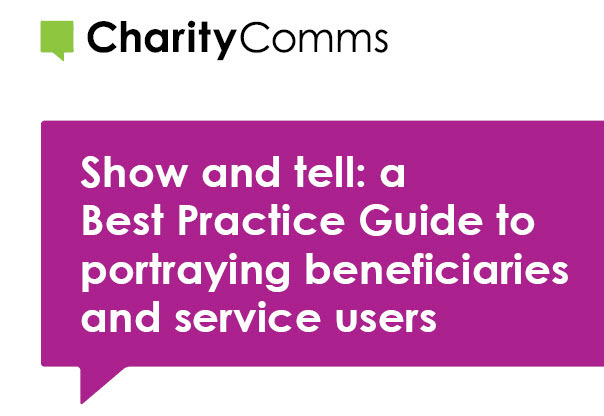 Show and tell: a Best Practice Guide to portraying beneficiaries and service users was the first of what is now a series of best practice guidelines from CharityComms. Download it for free here. Our guides pull together experience and practices from across the charity communications sector and produce inspirational materials that help communicators build their skills and address their key challenges. Each set of guidelines has a steering group of people behind it whose job is to make sure the final product is representative of the spectrum of ideas, experiences and wisdom. CharityComms’ job is to moderate and meld the different voices and views. We aim to do 80% of the thinking work behind the issues covered in the guide, to make your job easier. In retrospect, we could have chosen for our first set of guidelines a topic less knotty and complicated than portraying clients and beneficiaries. But we chose this because it fulfills perfectly our criteria for guidelines: that by sharing knowledge and ideas CharityComms can improve the quality of charity communications and reduce the burden and workload of communications professionals in the sector. In other words, what we hope to do with our guidelines is to do the majority of the hard work for you. We can’t do it all, but we can research and share what other organisations are doing. We can tell you about the resources that already exist and other sources of knowledge and ideas. We can make your job easier by setting out the key decisions that need making and a logical and clear process to follow. We picked portraying beneficiaries as our first topic because it’s an area that creates plenty of problems without there being much guidance on how to tackle it. The way a charity talks about its beneficiaries is often a bitter point of contention between fundraisers and communicators. It undermines many brand strategies. Fundraisers want to motivate donors to give (an ambition which appears to justify almost any portrayal of clients), while the comms and service teams want to portray clients as empowered, positive and barely in need of help. Unfortunately, the compromise many organisations reach doesn’t satisfy anyone. Our guide aims to help you resolve these dilemmas and create your own guidelines, tailored to your charity’s specific issues, sensitivities and goals.